MRL Ltd.´s Agaricus blazei powder contains both mycelium and primordia (young fruit body) cultivated into a biomass that is grown on a sterilised (autoclaved) substrate. The cultivation system is proprietary, allowing for standardised production of Agaricus blazei. The powder biomass is then sealed in plastic containers. The Blazei-MRL biomass contains mycelium and primordia (young fruiting body) of the respective mushroom. In comparison to Agaricus extracts, biomass has the advantage of no unwanted shift of effect which happens with extracts or concentrates, including lyophilisation, and thus the activity of the product corresponds with the source mushroom, while being further intensified by utilizing the entire mycelium. The Agaricus blazei is processed under the same rigorously controlled conditions that are applied to the manufacture of a conventional pharmaceutical. 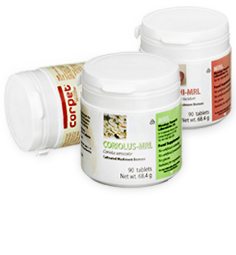 This ensures that each tablet contains 500 mg of the standardised Agaricus product. The fungal biomass Agaricus blazei that comprises Blazei-MRL is certified 100% Organic in the United States by Quality Assurance International (Certificate No. 103491-A). ** Agaricus blazei supplied by Mycology Research Laboratories Ltd.
*** Cornelius C. e tal “ Comparative Enzyme Analysis of Polyporus umbellatus, Agaricus blazei, Pleurotus osteratus and Hericium erinaceus” pp 5, Clinical Journal of Mycology, 7;2009 Vol II.